Embroidered shirts are some of the most popular items purchased. We create shirts that make you look great whether you are installing a sink or pitching your product at a trade show. With over 200 styles to choose from, there is something for everyone. Once you have chosen a style the next thing you need to choose is an embroidered logo. Some company logo’s are already designed and just need to be converted into an embroidery format. We have many years of experience converting corporate logos into embroidery. Look out for embroidery shops that offer low cost embroidered shirts but charge huge shipping fees, setup, or do not use name brand apparel. We use only brand name apparel, no hidden fees, and have the fastest delivery in the industry. If you are looking for a company to provide embroidered shirts then look no more. Any sport or event is made even more special with customized Embroidered shirts– t shirts, polo shirts and denim shirts are all customizable, created by you right in our Virtual Lab. 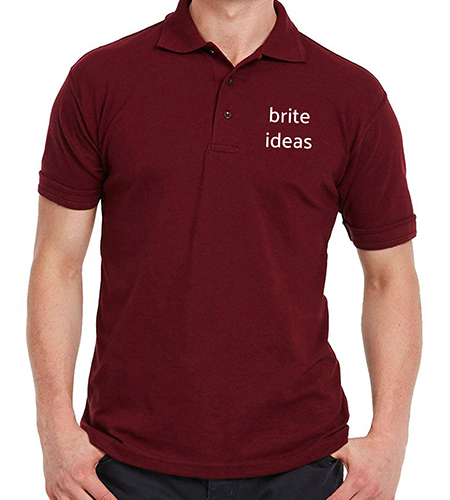 Polo shirts are a great way to advertise your business or use on casual Fridays for your staff, and it’s easy to design personalize shirts with names, numbers, logos and art. Youth embroidered t-shirts are great for children’s sports leagues. Embroidered shirts not what you’re looking for? No problem – Embroidered caps, hats, sweatshirts and jackets, too. If you need assistance with your design or order, our sales and service team is available until your order is delivered – guaranteed. Embroidered shirts are great looking custom corporate apparel, custom logo shirts, embroidered golf shirts, and other business promotional products. We supply a huge array of international businesses with fine corporate apparel from the major specialty wear companies. We’re sure you’ll enjoy your shopping experience here, and we sincerely appreciate your patronage! Personalized and Embroidered shirts made especially for you! Embroidered t-shirt and sweatshirt designs for all ages! All embroidery is available not only on our clothing selections but also we have golf towels, hand towels, kitchen towels, baby bibs, burp towels, canvas bags and totes, wine bags, and more! Of course because all orders are made when we receive them we can tweak them, give them that personal touch you would like for that project. We welcome special orders! This shirt is great to wear on the weekends or even for casual Friday. Rugged 100% cotton denim, double-needle stitching, button-down collar, patch pocket, back pleat and button-through sleeve placket and adjustable cuffs. This shirt is embroidered above the left pocket with the Speedy logo or the full PVA logo. Personalization on the back neck available for an additional cost. Enjoy your embroidered shirts in a fashion-forward tee shirt whether you are an adult or child with either the PVA or Speedy logo embroidered on the left chest on a white shirt with navy blue trim. 100% heavyweight pre-shrunk cotton, contrasting neck and sleeve bands and double-needle stitching on the bottom hem. Personalization on the right sleeve available for an additional cost. Be sure to get one of these classic golf embroidered shirts. Embroidered on the left chest with your choice of PVA logos. 100% pima cotton; 3-button placket with mother of pearl buttons; additional yarn in collar and cuffs for a neater appearance and durability; split tail; stretch tape in shoulders for extra strength. This shirt is pictured with the Speedy logo but is also available with the full PVA logo. Personalization on the right sleeve available for an additional cost. This high-quality golf shirt is available with your choice of logos – the PVA Logo or the Speedy Logo. 60% cotton, 40% polyester ClimaLite interlock with hydrophilic finish. Full-fashioned rib-knit collar with contrast tipping and contrast three stripe on back neck. Rib knit cuffs with contrast tipping. Extended back length with vent hem. Two-button placket, Adidas logo buttons. These stylish embroidered shirts look great and wear well on the golf course. Personalization on the right sleeve available for an additional cost. This comfortable sweatshirt will make you feel like you have worn it for years. It is pictured with the Speedy logo on the left chest but is available with the full PVA logo. Exclusive process removes shrinkage. Low pill, 50% cotton/50% polyester. Spandex in the collar, cuffs and waistband. Personalization on the back neck of these embroidered shirts is available for an additional cost. This great long sleeve twill shirt is 100% cotton and has features such as neat button-down collar; horn buttons; center back pleat; shrink resistance and longer tail. These embroidered shirts are available in a variety of colors and with the full PVA logo or the Speedy logo. Personalization on the back neck available for an additional cost.